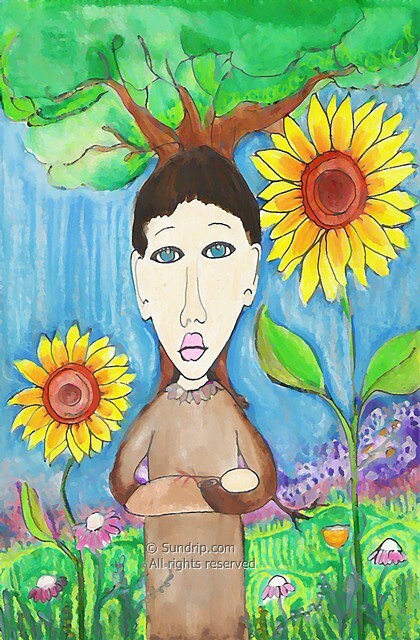 Spring of Youth was created on watercolor paper with ink, crayola crayons and crayola markers. In addition to the stated media there are small details completed in pigmented glue. The painting shows a little girl with big blue river like eyes walking through a field/forest while carrying and infant. 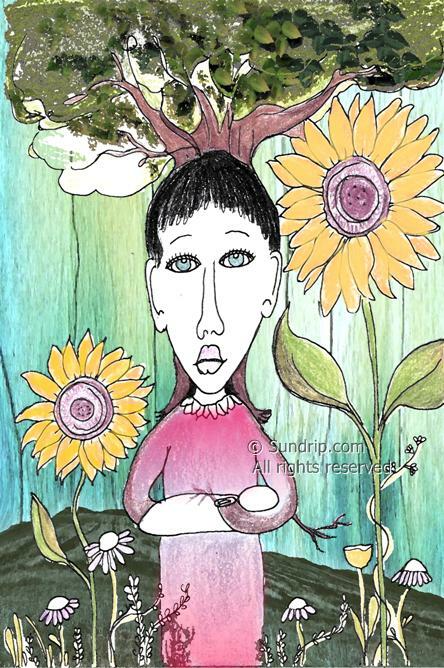 There are two huge full sunflowers, small vines and small daisy flowers around her. She has a tree growing from her black hair and her arms are made of wood, her clothes made of sack cloth. Spring of Youth is available in my Etsy shop. Please see my sidebar for the link. 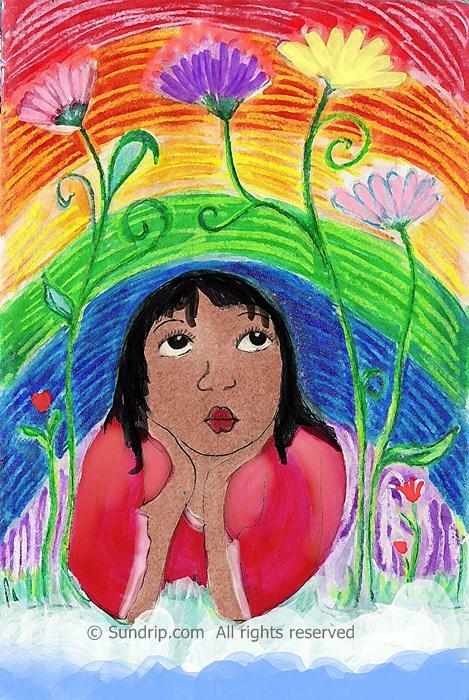 Rainbows and Daydreams is a painting from my sketchbook that shows a little black girl dreaming amongst the flowers. Media: Crayola crayons, Crayola markers on 6x9 sketchbook paper. Minor digital corrections. A little birdie came to tell but I already knew. 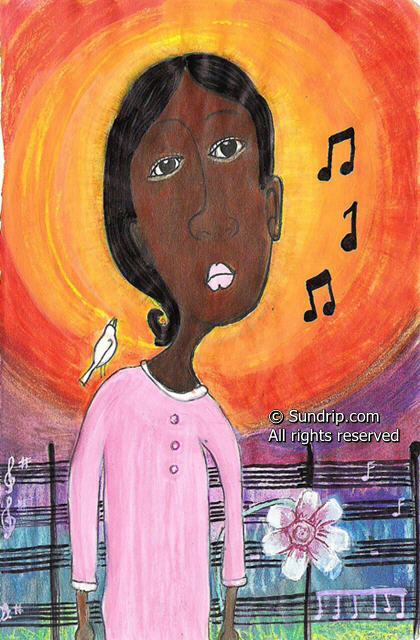 "She sings my tune, she knows all the words" is black folk art depicting a young black girl with a white bird on her shoulder sharing secrets. This original mixed media painting was created on 6x9 paper in oils, watercolor and ink. What I like about this painting is the small treble clefs in pink on the sheet music fence and the rainbow colors that wind behind it. She's got the sun beaming in yellow and orange behind her and a white flower beside her. This folk art piece is simple and pleasing with bright colors and traditional symbolism. Please see my Etsy shop for purchase details. The link is on the sidebar. The mama snail I added to my aquarium recently had a few babies. I've watched these little tiny lives grow from the size of a pencil eraser to now the size of a dime. They're so, so sweet. 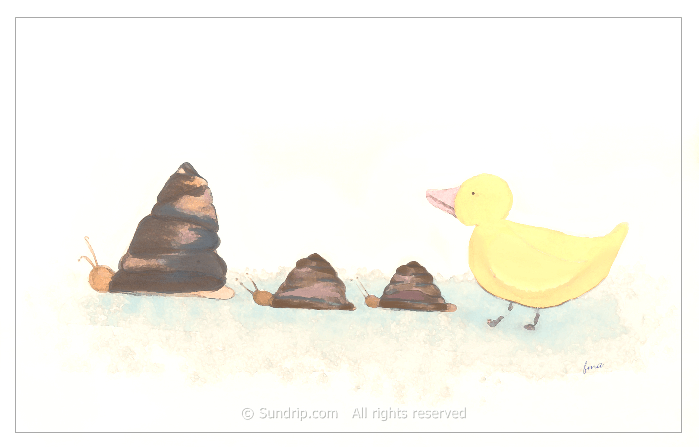 For those of you who are unaware Little Duck is my nickname, which means the little duck in the picture is me following them around watching them grow. The original sketch is in my sketchbook and was done in ink and tea stains. The picture published has coloring corrections and a few tiny other details added. Thanks for visiting Sundrip, it's much appreciated.
. .Focus and grow against all odds. 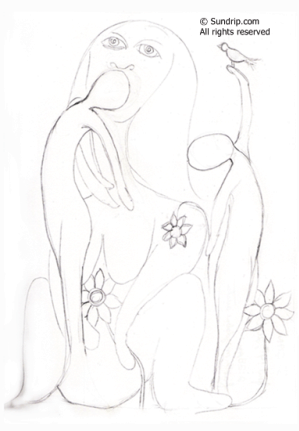 These two pieces from my art therapy sketchbook shown two figures with a central eye directing them through life. Both have one large flower included in the painting and a very still background. "Version Two" shows much more activity with the sun on her shoulder and pools of water on her breasts. She, unlike "Version One" has a scar under breast and is holding a single red flower. She also has flowers above her head and blades of grass at her feet. I'd describe the two pieces as figurative and surreal.
."Snakes Scorpions and Mothers" is also an oil painting from my private art journal. It shows a mother holding her newborn as well as a snake around the mother's neck. With an out stretched hand she holds a golden egg. You'll also see wheat, small and large flowers, a churning sky in the background and detailed home life in the wings of the mother. 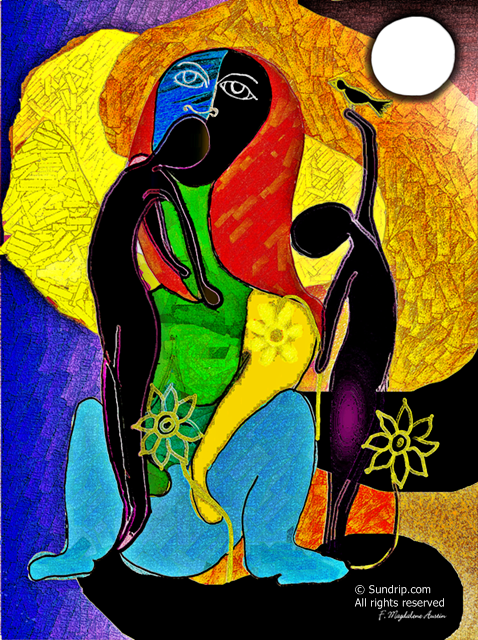 "Mother of the World" also shows a mother holding her newborn. She's standing in a field of fantasy flowers, swirls and colors that run into one another. Some of the colors were made to drip, run and bleed into one another for a raw yet strikingly chaotic atmosphere. You will notice that in addition to holding the child up right she has balanced growth and life in the other. Included in this painting are black flowers and a red crown above the mother's head. The art work above can be seen in my Etsy shop along side other original works of art. Please see my sidebar for the Etsy link. 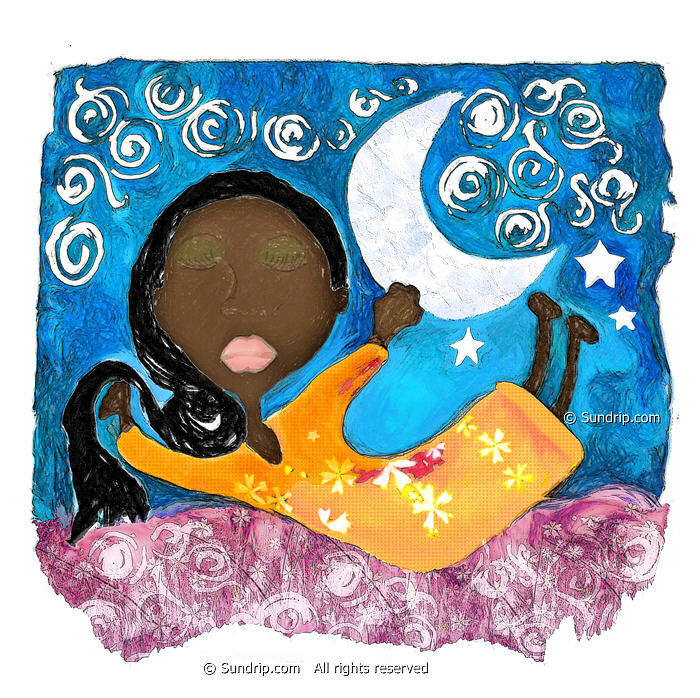 In this mixed media painting a little black girl flies through the night in her orange gown and holds the moon while dreaming. The original painting is on cardboard and includes oil paints and oil pastels. The background swirls were created with puff paint to make them 3D and her dress was made with pieces of coffee filters died with orange and red watercolors. The coffee filters were allowed to dry then they were glued to the surface after which I painted a thin layer of clear finishing glaze. The digital version shows a change in her dress. Instead of a solid orange textured dress the digital version shows flowers with various shades of yellow, orange and red. 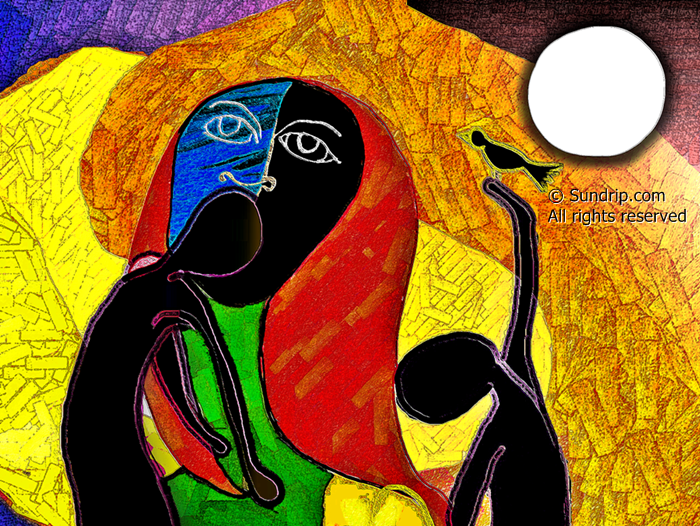 Art Details: A bright orange dress, flowing black hair, long eye lashing, black child holding the moon, pink, blue and white swirls, sleeping child under bright stars. In both versions of this painting the little one dreams peacefully. These are the first little clay sculptures I've done in years. I started working with clay as physical therapy for my hands and found that I thoroughly enjoy it. The three bird candle holders shown were all done completely differently. The first bird starting from the far left is clay with a porcelain overlay. The middle bird is only clay and the blue bird to the far right of the screen was sculpted from paper clay. All were air dried and hand painted then sealed with a high gloss acrylic seal. 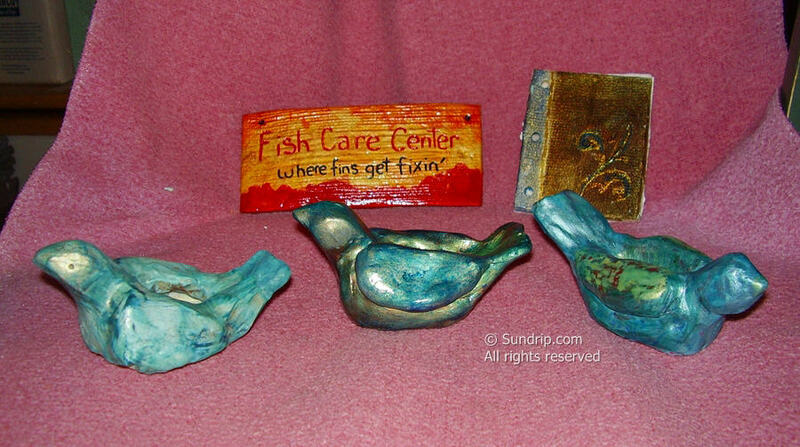 Also included in the photo is the sign that hangs on my fish tank hospital which says, "Fish Care Center: Where Fins Get Fixin' " I have a separate little tank for little sick fishes and that's the sign that hangs on that tank. It's too cute. Stone and Shadows was originally sketched in pencil on paper. Please remember all work is copyright protected. See my sidebar for the full copyright statement. They're made of acrylic oil and saw dust on square wooden boxes. The "hiders" can also be arranged on the wall vertically or diagonally, matching edges as you want. I like to make large earth like wall collages out of them by matching up the browns to look like an island and the blues to appear as water. There's no set way to place these squares. To get a better idea of what the texture is please see the pieces called Rolling Hills, Out West and Three Oceans. 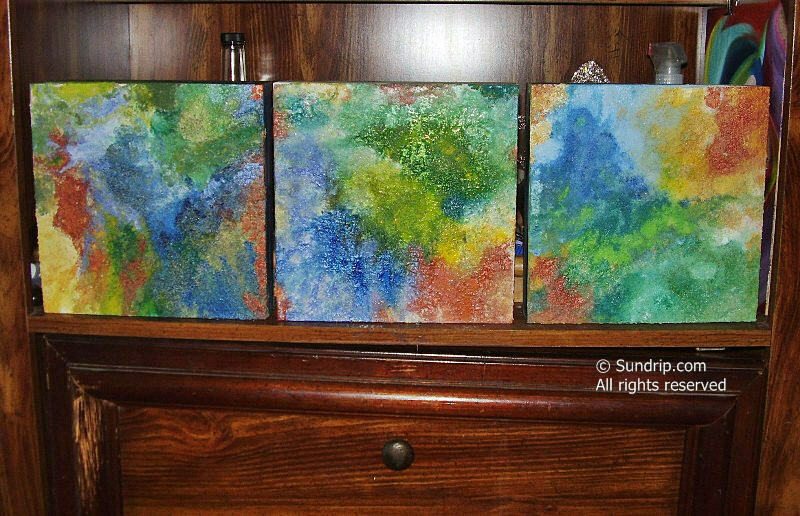 ...continue reading "Square Box Junk Hiders"
"Home" is a simple oil and acrylic painting with a childlike feel. The idealistic setting of a white house and white picket fence is painted on textured cardstock. Instead of brightening the rainbow I used darker blues and a darker red then added a dark frame. This adds a nice "grown up" feel to a timeless setting. "Home" is now available in my Etsy shop.